Fresh Air Interviews: Green Day front man Billie Joe Armstrong - 'Having The Time Of His Life' The frontman for the pop-punk band Green Day details the group's early days in Berkeley and describes what it's been like to see American Idiot, a new Broadway musical based on one of his albums. 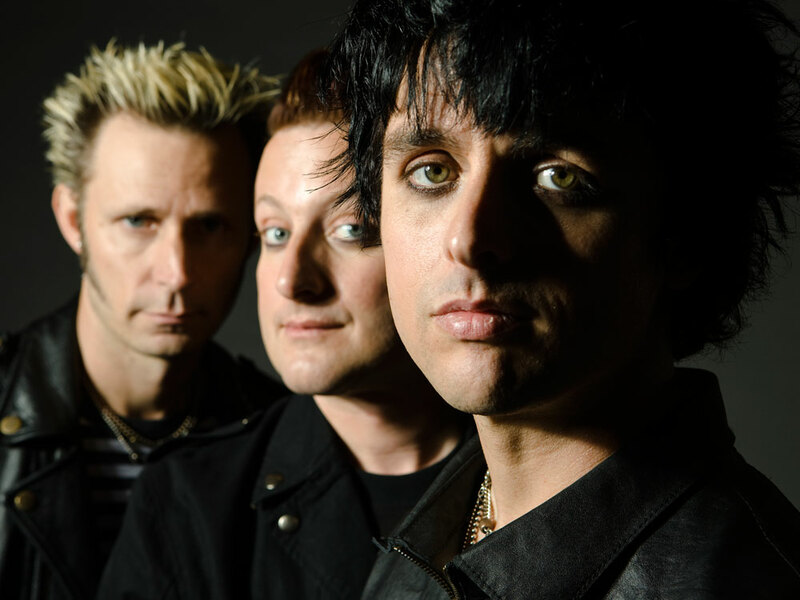 Green Day formed in 1987 with frontman Billie Joe Armstrong (right), bassist Mike Dirnt (left) and drummer Tre Cool (center). In 2004, Green Day, the punk-pop band fronted by Billie Joe Armstrong, released a Grammy-winning album called American Idiot. Instead of looking inward for his material -- as Armstrong had done when he wrote songs about his anxiety, relationships and panic attacks on the albums Dookie and Nimrod -- he decided to write about politics: specifically, the alienation and anger he felt during the presidency of George W. Bush. "In the beginning, right after 9/11 and watching the sort of tanks going into Iraq and these embedded journalists going in live, it felt like a cross between war and reality television," Armstrong tells Fresh Air's Terry Gross. "So I just felt this great sort of confusion, like, someone needs to say something. ... For me, I felt this moment of rage and patriotism, I guess, if you'd want to call it that. So that wrote itself in probably 30 seconds." 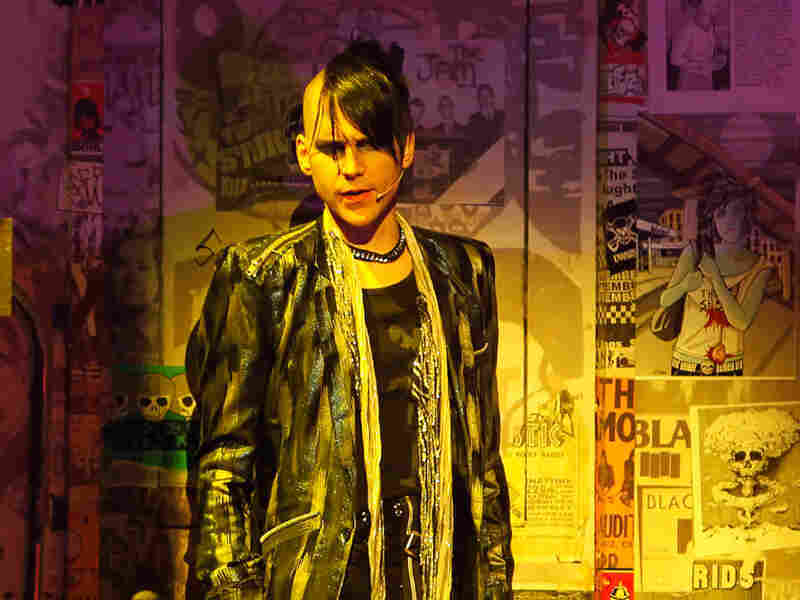 The punk-rock opera, as the album was called, was recently turned into a Broadway show with virtually no dialogue -- and with the actors telling the story largely through movements on stage. Armstrong says that watching his musical vision come the stage was a transformative experience. "It goes from a three-piece band to a 20-piece vocal ensemble," he says. "When we did the album the first time around, it was me, Mike Dirnt and Tre Cool doing everything. Then, this time, it was dealing with the string section and all the characters and how all the characters were coming out in the musical." 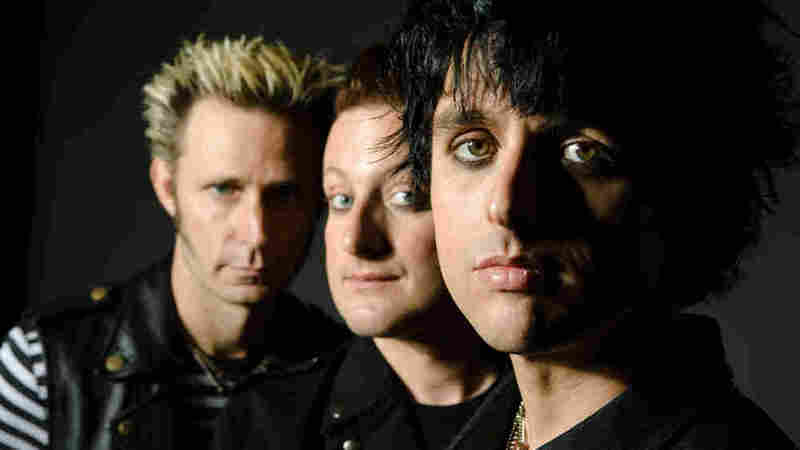 American Idiot, which has been nominated for several Tony Awards, is the latest in a two-decades-long string of success stories for Green Day. The band was created a few years after Armstrong met Mike Dirnt, his bassist, in one of his elementary-school classes. Tony Vincent as St. Jimmy in a scene from American Idiot. "I remember the first conversation we had in Mrs. O'Connor's class," Armstrong says. "I met Mike, and he came over to my house all the time. We became really close. My father was dying [of cancer], and Mike came into my life at the same time." Armstrong and Dirnt started their first band, Sweet Children, while they were still in high school. The band would then go through several transformations before picking up a drummer, Tre Cool, in 1990 -- and adopting the name Green Day. In 1994, the band released its major-label debut, Dookie. The album, which had several hit singles -- including "Welcome to Paradise" and "When I Come Around" -- would go on to receive the Grammy for Best Alternative Album and sold more than 10 million copies in the U.S.
Armstrong notes that one of the album's best-known songs, "Basket Case," was initially one of the toughest to write. "The lyrics kept changing," he says. "It started out as a relationship song, and I got the idea for it to be more neurotic and a panic-attack song, and it seemed to hit home. And I didn't even expect the song to even be a single. It seemed like it was a difficult song to play. Then it got released, and I guess I was wrong about that." After the commercial success of Dookie, Green Day released a moodier, darker album called Insomniac before taking a break in 1996. A year later, the band regrouped and released the album Nimrod, which featured the single "Good Riddance (Time of your Life)." The song, featured in the finale episode of Seinfeld and two episodes of ER, received an MTV Video Music Award for Best Alternative Video. Around the same time, Armstrong says, he learned to become a better performer on stage. He says he realized that his concerts were a cathartic experience for his fans. "I think some people walk away from a Green Day concert with the emotions you would get from some kind of theater performance where the crowd feels involved -- where it's not just about the singer," he says. "It's not just about the band." "The first time that you escape from home or the small town that you live in -- there's a reason a small town is called a small town: It's because not many people want to live there. So to try to get out and see something more -- for me, I had a place called Gilman Street, it was a punk-rock club up in Berkeley, and I was just introduced to a lot of new ideas. I think that was my escape. And there was another moment in time where I felt empowered because I was getting another education that I wasn't getting at home anymore, or from the schools that I had to go to. It was just this feeling of, 'I'm out of prison.' "
"In every song I write, whether it's a love song or a political song or a song about family, the one thing that I find is feeling lost and trying to find your way. I think "American Idiot" is a series of questions. I think "Holiday" is a series of questions. It's like, you're trying to battle your way out of your own ignorance ... like, 'I don't want to be an American idiot. What I want to be, I'm not sure, but I just want more. And I'm willing to take the risk to try to get out of that.'" "I used to do it a lot right after Dookie came out. I was arrested for it in Milwaukee, Wisconsin. I did it at Madison Square Garden, 'cause I didn't know if I was ever going to play Madison Square Garden again, so I said, well, there's one way to remember this occasion -- to be the guy who was naked on stage at Madison Square Garden. And then it came down to a point where everywhere we played, the cops started showing up and started saying, 'If this guy gets naked on stage, he's going to be arrested immediately.' And sure enough, it happened eventually in Milwaukee."